These Torque Stix are low cost and efficient. There is nothing to calibrate or maintain and the end result is properly torqued wheels and satisfied customers who demand properly torqued lug nuts. Vehicle torque specification chart also available. Find out your correct torquing specs quickly and easily with this handy chart. Use your own 1/2” drive impact sockets with these torque stix extensions. An economical choice to achieve accurate torque settings. These 1/2” square drive impact sockets are deep and thin walled to reach areas conventional sockets can’t reach. Both part numbers provide two sizes. This set safely removes and replaces GM, Ford and Chrysler wire wheel hubcap locks on 1978 and up vehicles. Variable drive keys will also fit Corvette, McGard hubcap locks and aftermarket wheel lug locks. Kit comes in a durable plastic carrying case with complete instructions. Replacement parts available. For quick and easy removal of indentations on wheel flanges and rims of most vehicles. Allows proper tire seating, giving greater tire protection and durability. This tool is powder coated for added durability. 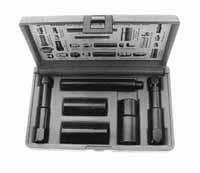 The best tool for removing or installing passenger car and light truck wheel weights. Incorporates hooks for removal of wheel weights on many different types of wheels. Not for use on aluminum or decorative wheels. This heavy duty wheel weight tool has a special grip hammer and pliers for removal and installation of truck wheel weights. If you are using steel wheel weights, instead of lead wheel weights, this is the tool for you! This tool checks for variance in dual tire mating. Right and left tires should not vary more than 1/2” in diameter. Compare tires by placing the long arm against the side wall and the short arm against the tread. Protects from scratching chrome, aluminum, and painted truck wheels when removing lug nuts. No-Mar coated jaws allow harmless removal and installation of chrome nut covers on light truck, motor home, and over the road truck lug nuts. Ten wear-resistant teeth bite into broken or stripped inner budd nuts, and removes them easily. Designed to be used with a 1-1/2” socket or a 3/4”drive air gun, ratchet or flex handle, this great tool will pay for itself the first time you use it!